I finally broke down the other week and picked up one of these to help me pin the more delicate pieces I have in my projects. To be honest, I wish I'd bought one sooner. Until now, I've been using my regular cordless drill with a tiny bit attached to it. I wasn't having a huge problems with this setup, but it was a little awkward when it came to drilling some things. That and I was constantly breaking the drill bits and having to buy new ones. But this little hand held thing has no trouble with plastic or pewter. It comes with a few extra bits so I'm not too worried about wearing one down any time soon. Even if I do, I should be alright for a while. I've used it a bunch of times so far. From drilling out gun barrels to pinning models to bases. The drill bit is the perfect size for the large paper clips I have lying around. They fit nice and snug with no extra room so the joint is good and solid. I've used it to drill out arm joints and hands as well and I've found that if I take my time, the manual drill doesn't deform the piece I'm drilling and cause problems with splitting or opening it up. Another very nice feature. If you don't have one and you find yourself needing to drill out pieces so that you can pin them together, I would highly recommend you get one of these. The one I have comes from GW, but I suspect any brand will work just as well. They run about $15 and I would say to make sure you get a quality one (regardless of the brand you end up with), you don't want this breaking on you and you don't want to have to buy another one later on because you went "cheap" the first time around. If you're going to be doing the kind of work that requires drilling at this scale, go ahead and get something that won't cause you any more headaches. Once you have it, you'll wonder how you worked without one. I'm still using the same modelling drill I picked up from GW some 13 years ago. Brought one box of assorted drill bits but other than that it's done me proud over the years. Yup the up front cost for learning on a solid pin vise from GW was worth it. Next you'll start ordering specific bits matched to your pinning material. MicroMark is great for that. Privater Press also sells matched sets of brass rod and bits. I don't often play the 'grumpy old gamer' card, but actually the newer pin vise (as pictured) is an inferior product: the older metal one is far better engineered and gives a smoother rotation; it also seems to hold the bits more firmly. I only use the newer, coated one for larger drill bits, having used the ubiquitous 1mm bit for a pilot hole first. And you're right, Ron: they're ideal for paperclips! I don't do a lot of pinning, but I recently started working with magnets on some of my models and I think a hobby drill would make things a lot easier. Thanks for the tips! funny that after all the great work you do, you never had a basic pin vice. In the event you need a hole bigger than the hobby bits you have; you can take a normal drill bit and a punch handle to act as a make-shift hand drill. 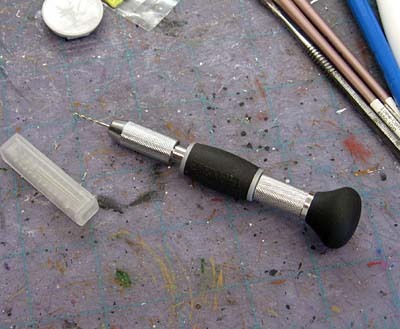 The punch handle is adjustable to accept multiple sized drill bits, much like the hobby drill. I've done this for magnets that are 3/16 in size. Makes it a little easier than doing a pilot hole with the hobby drill and then gouging the hole bigger with a knife. I have one since 2003 and it has served me well over the years. Any serious modeler should have one. and also a dremmel; very important, too. Nearing on 5 years with my current drill bit, and with about a dozen drills so far I'd say it has been a steal considering all the times it has made things (in and out of the hobby) easier for me! Almost Required for ANY Forge world project. I'm surprised you have just got one. I've had one since before most of my paints. It and the clippers and files are almost required. As previously mentioned a Dremel is great, I use a pin vice for super delicate things (tiny resin bits), and a dremel with various tips and bits for other things (got 60 rivets to place on a tank hull? use a dremel to countersink the pre-marked holes and then glue in your tiny beads/rivet heads). I got my pin vice from Mitre 10 over a decade ago, although a lot of good hardware stores will likely have them. For drill bits I buy direct from an Industrial Wholesaler (Bolts & Industrial), to ensure I get good quality HSS bits that will even drill Stainless if needed. The biggest thing is knowing when you need to back off and clear the swarf, especially when working with white-metal. THe modelling drill is amazing for magnets and pinning. Don't know where I'd be without it, especially notbeing an advanced modeller myself. The new style GW pin vise may have been the best thing I ever bought from them. I have a couple that I bought from the Snap-On guy who visits my work. Best modelling tool I ever bought. I'm still a great believer in the Dremmel. It's speeds can get low enough to be safe for plastic, and the buffing/sanding wheels are great for getting rid of mold lines.